Bell's inequality allows testing experimentally whether nature can be described in a local-realistic way. Such tests set very stringent experimental requirements in order to avoid introducing additional assumptions and thereby opening “loopholes” for possible local-realistic descriptions. Our recent realization of a Bell test, based on heralded entanglement of widely separated atoms together with fast and efficient measurements, fulfills those requirements. A single run of the experiment containing 10000 measurement events on entangled atoms yielded the result S=2.221 ± 0.033, violating the classical bound of S≤2 by more than 6 standard deviations. The upper bound for the P-value for this run is 2.6⋅10-9. Altogether, over 55000 events were collected over 7 months of measurements yielding a P-value of at most 1.02⋅10-16. This makes the hypothesis that this experiment could be described in a local-realistic way extremely improbable. 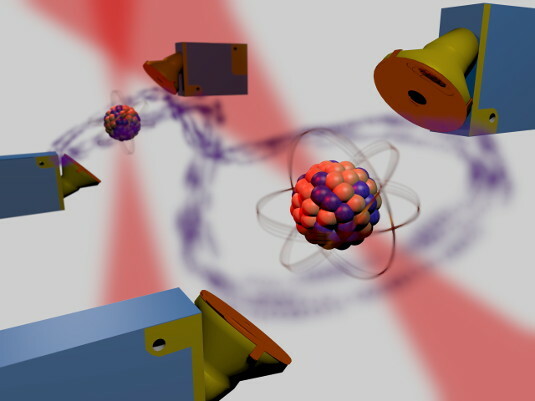 Artist's view of measurements on entangled atoms.